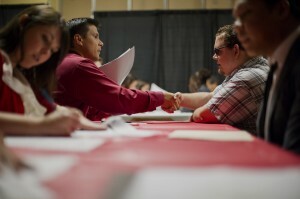 The economy added a higher-than-expected 288,000 jobs last month, and the unemployment rate fell to 6.3 percent, its lowest since September 2008. At the recession’s peak, the unemployment rate was 10 percent, but as the New York Times reports, April’s 6.3 percent is still above the historical average for this stage of an economic recovery. For all of the good news in Friday’s report, economists are concerned that 800,000 people dropped out of the labor force, which means they’re not looking for jobs, and therefore, are not counted as officially unemployed. Making Sen$e calculates its own unemployment rate called the “Solman Scale,” or U7, which adds to the officially unemployed part-timers looking for full-time work and “discouraged” workers — everyone who didn’t look for a job in the past week but says they want one. This broader unemployment metric also saw a significant drop in April, to 14.38 percent from 14.75 percent in March. NewsHour economics correspondent Paul Solman has more analysis about Friday’s jobs numbers on his Making Sen$e page. Economists surveyed by Bloomberg had predicted an addition of 218,000 jobs, but each month’s payroll numbers from the Bureau of Labor Statistics carry a margin of error of nearly 100,000 jobs and will be revised two more times in subsequent employment reports. The BLS revised job gains in February and March up by 36,000. At the conclusion of their Open Market Committee meeting Wednesday, the Federal Reserve said the economy was looking strong enough to support further labor market improvement, and as expected, they continued to gradually reduce their monetary stimulus program by $10 billion a month.